At first let’s clear who is to turn lace bobbins. Correct answer can be got after accurate definition – what bobbins are under consideration? There are bobbins that are real work of art, having not only evident usefulness for lace plating but they are pleasant to look at and held in hand. In West Europe bobbins are decorated with carving, coloring and mounting beads at tail ring. Making such bobbins is described in the book of a big master in this art . This high professional level can not be achieved if bobbin making is episodic amateur work only. Plating techniques spread in Russia dictate another style of lace bob-bin making. In plating process less quantity of bobbins take part but bob-bins are twice longer. External view of bobbins is beyond attention, more meaning has comfort in hand, for that purpose bobbins are to be polished. 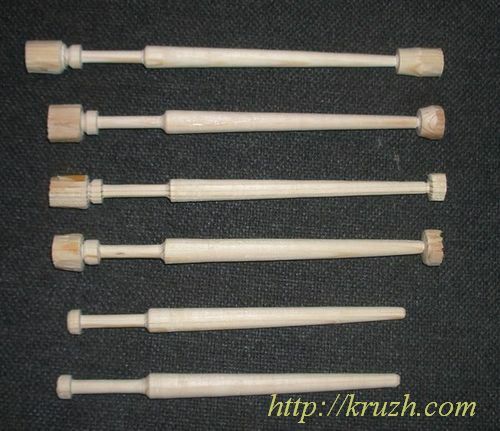 Such bobbins can make any turner, even beginners, due to very simple form of bobbin. Nevertheless making Russian bobbins can be a creative work too de-spite of low demands. Turning is accessible for any lace maker, and she can even get pleasure out of turning. This work is easy but rather discomfort due to sawdust and noise produced with electric motor and reducer. By the way there were many women-turners always in Russian aircraft industry and instrument making where a plenty of small details are produced of color metals, titan and stainless steel. So it is difficult to sur-prise somebody in Russia if a woman controls a lathe. However lace plating sphere is peculiar. If a lace maker wants to turn own bobbins, of course, she must be free from draft work that is being maid with cutting tools. She must escape any chance to injury her fingers. Turning details of wood is described at great length in many useful books [7, 10, 11, 12, 13] both in Russian and English. There is a video as well about lace bobbin turning . Teaching turn techniques is not a goal of the book. We can suggest only concise enumeration of basic operations. The stages 1 to 4 are draft work. 1. At first wood supply is maid. Wood stock is being held several months (or even from 1 to 2 years) in warm dry place. The material must lose main part of its moisture. There are soft and hard wood. Pine, spruce and linden – these trees have soft wood. Birch, maple, juniper and beech (the last is spread in south Russian regions only) – these have hard wood. 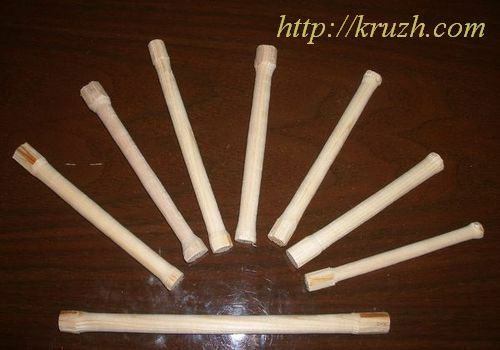 The harder is wood, the better surface of bobbin can be made. 2. Half finished products (wood tetrahedral bars) are cut. 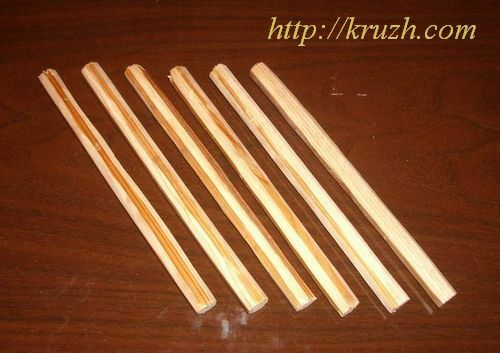 Bars must be straight and free of such defects as knots, holes and putridity. 3. Tetrahedral bars are transformed into octahedral ones (Fig.6.7). The nearer is to cylindrical form, the better. The operation is produced with a plane, a knife and a file. The bars must have allowances in length and diameter for the future lace bobbin. 4. Octahedral bars are transformed into cylinders (Fig.6.8). Such a cylinder has another name – a blank. This operation is fulfilled with chisel on a lathe. When a cylindrical surface is achieved firstly the lathe is stopped. Diameter is measured. If it is too big, the next lay of wood is to de deleted and so on. The draft operations enumerated above are not recommended for lace makers. It is a work for men. The next operations are to transform a blank into finite production, i.e. lace bobbin. 1. Marking-out is made on the rotating blank using a pencil and a ruler (or a bobbin template). 2. Bobbin neck and head are turned. The lathe is stopped often to measure diameters. 3. The woodturning support is turned on the lathe bed at the definite angle for turning bobbin handle (tail) if it is to get a conic form. 4. Bobbin surface is cleaned with files and emery paper. 5. Bobbin surface is polished with wooden bars having more hard surface. 6. Incisions are made at allowances verges escaping lost of solidity in junctions. 7. The bobbin is set out of the lathe (Fig.6.9). The end allowances are deleted with a handsaw. 8. Bobbin head and tail are cleaned in places of lopping with a file.